dining table, telephone and satellite tv. Kitchenette with two electrical plates, microwave, watercooker and fridge. The bathroom is equipped with a shower/bath, toilet and hairdryer. Balcony or terras with seats. These apartments can be used by three people. 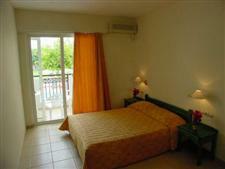 Identical to the single room apartments with addition of an extra two person bedroom. These apartments can accomodate four people. 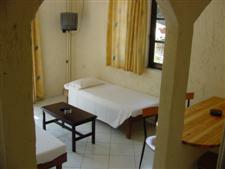 All apartments have aircondition and a locker. Daily cleaning of all rooms and linen/towel changes 2 times per week. Extra changes possible on request.